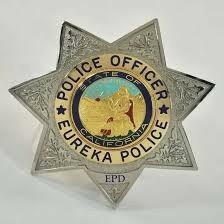 A Eureka man was arrested on suspicion of a series of charges Sunday night after allegedly crashing a stolen semi-truck into a tree on Herrick Avenue then running through the Elks Lodge parking lot with a rifle. Residents in the area were asked to shelter in place while police searched for the suspect, according to an EPD release. After setting up a perimeter around the mobile home where the man was believed to have fled, police said Patrick Holt ran from the residence and was detained by officers. He was later arrested on suspicion of auto theft, burglary, being a felon in possession of a firearm, felony vandalism and resisting arrest. On 9-16-2018 at around 1823 hours, the California Highway Patrol requested an agency assist for a semi-truck that crashed into a tree on Herrick Avenue at the Elks Lodge. A short time later, H.C.S.O. Dispatch received reports that a white male adult dressed in a black hooded coat was seen running from the semi-truck with a rifle through the Elks Lodge parking lot. A short time later another citizen called reporting the suspect was seen running into the trailer at space #14 at the Fairway Mobile Estates, located at 525 Herrick Avenue. Units from the Sheriff’s Office responded to the scene and closed off Herrick Avenue and set up a perimeter around trailer #14. A Humboldt Alert was sent out to the area residents to advise them of the danger and to shelter in place. A surround and callout was conducted on the residence by Deputies. A subject later identified as the resident, Patrick Holt ran from the residence and was detained by Deputies. During this call for service, a representative from Ayers Distribution on S. Broadway in Eureka called to report a semi-truck had been stolen from the business and the office had been burglarized. Officers from the Eureka Police Department and a Cal-Fire responded to the residence and a sweep of the residence was conducted for any additional suspects. No other persons were located. A Search Warrant was obtained for the residence and numerous stolen items were located inside the residence including a stolen firearm. After an intensive investigation, it was determined probable cause existed to place Patrick Holt under arrest for C.V.C.10851 (Theft and unlawful taking or driving of a vehicle.) P.C.459 (Burglary) P.C.29800(a) (Felon in possession of a firearm.) P.C.148(a)(1) (Resisting or delaying a Peace Officer.) and P.C.594(b)(1) (Felony vandalism.) Additionally Holt was booked on an unrelated arrest warrant. The Humboldt County Sheriff’s Office would like to thank the Eureka Police Department, California Highway Patrol and Cal-Fire for their assistance in this matter. We would like to remind the citizens of Humboldt County of “Humboldt Alert.” Registering for this service will enable us to alert you of any situations you may need to be aware of that could be dangerous in your area. Ensuring the safety of all community members is the number one priority for the Sheriff’s Office. Anyone with information regarding this case, please call the H.C.S.O. at (707)445-7251.